Smoked salmon is such a wonderful bold flavour, and it seems to be one of those fish that most fish-haters make an exception for. However, the power of its flavour can almost be its weakness – without some creaminess or acidity to balance the rich saltiness of the fish it can put a real strain on the consumer. Often you’ll find salmon paired with chili on menus these days, but we mustn’t forget its old friend from the herb world – dill. An almost citrusy herb – and the secret behind Big Mac sauce – dill is a beautiful, fresh tasting accompaniment for any seafood, really bringing it into that summer evening vibe. 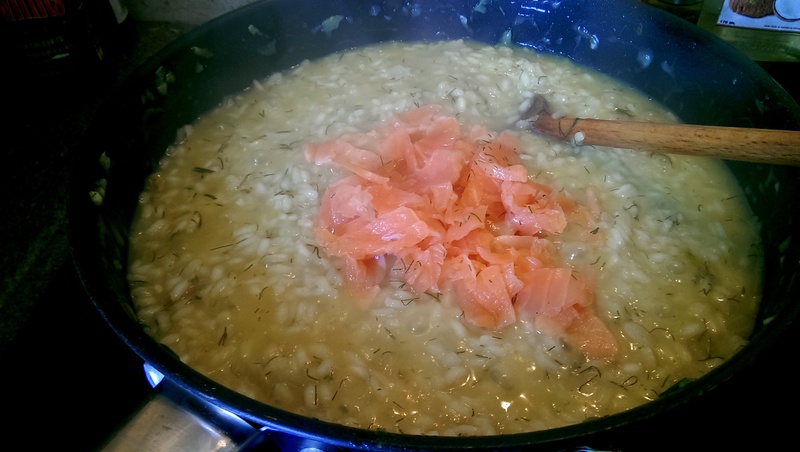 This particular recipe will leave you with a smooth, creamy, luxurious risotto. Be careful, though – it’s deceptively filling! Cream – Creme Fraiche if you’re feeling decadent, but single cream will work too. Chop the onion and garlic finely and gently fry in butter until the much of the moisture has evaporated and the onions are translucent. 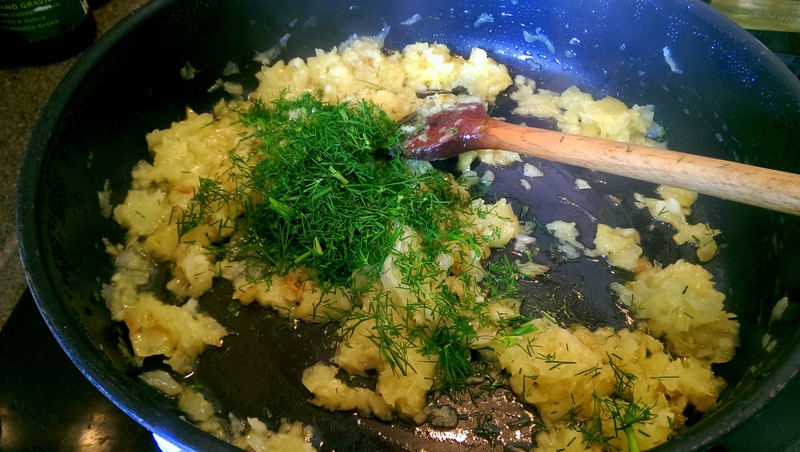 Roughly chop a handful of the dill and stir through, continuing to cook for another minute or so. 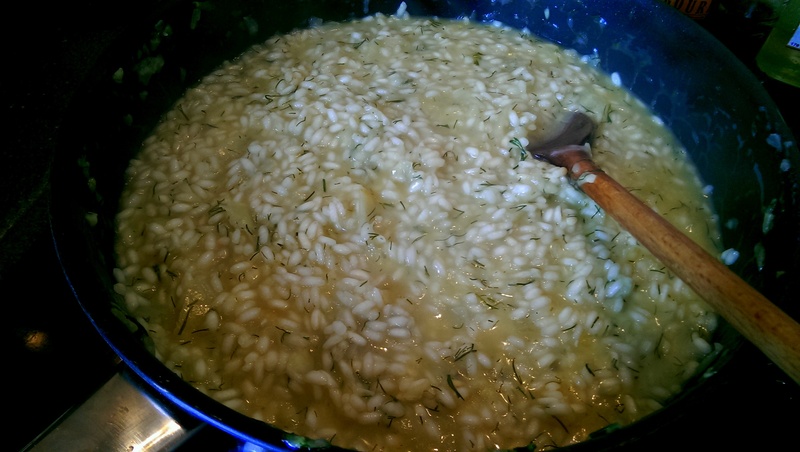 Add around half a cup of risotto rice per person and stir well. Don’t let the rice catch and burn, but you want to cook enough that each grain has turned translucent as well. Pour in a glass or so of white wine – it should sizzle as it hits the pan. Continuing stirring as it boils off. 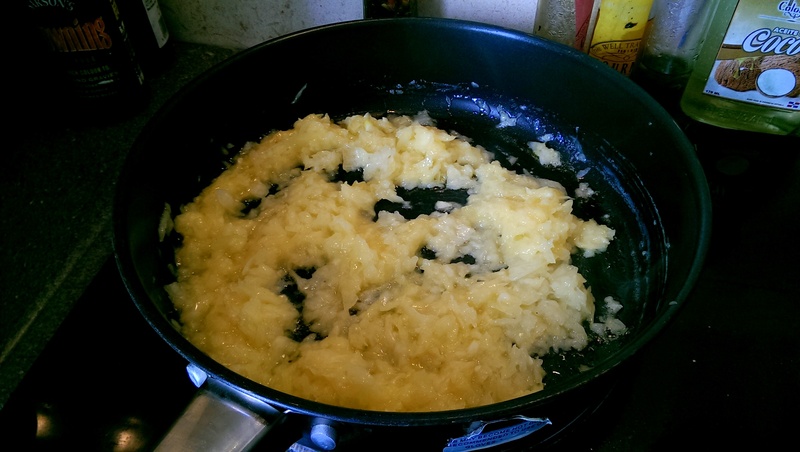 The mixture should become thick as the rice begins to absorb the moisture. When the wine has reduced sufficiently, begin adding one ladle of hot stock at a time. Stir it through until it too reduces and rice becomes softer. Repeat one ladle at a time, stirring constantly, until the rice is sufficiently soft. It is important to do it this way to make sure the overall texture of the dish is right. 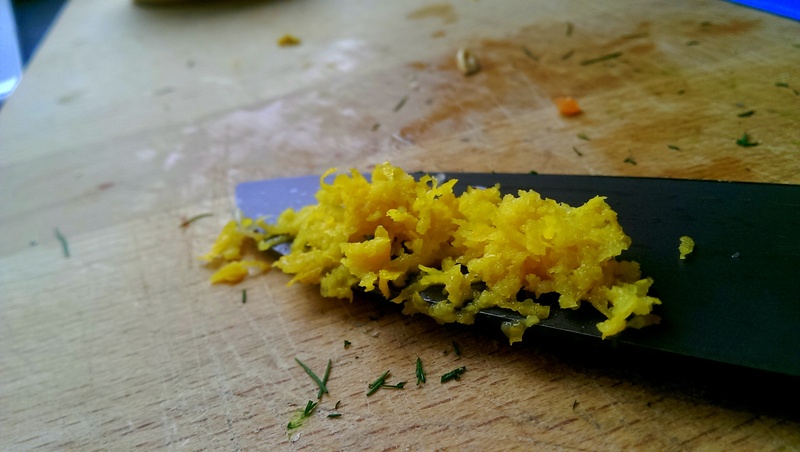 While the rice cooks zest the lemon and add to the mixture. When it is almost ready, slice the salmon and add. You don’t want to do this too early or the salmon will cook too much. 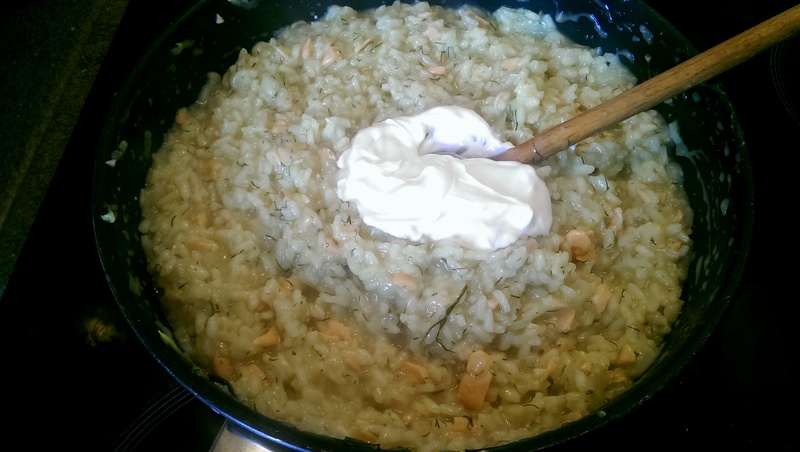 Finally when the rice is soft and the mixture thick, add the cream and stir through. Taste and adjust seasoning, and add a squeeze of lemon juice for acidity. 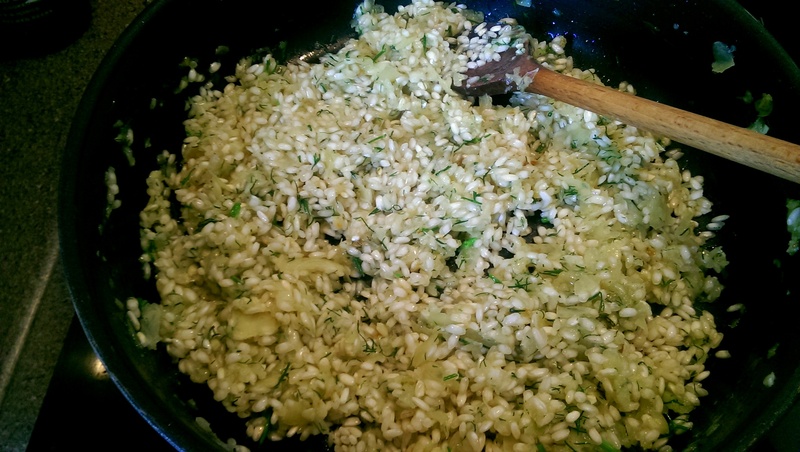 After this stage it is good to leave the risotto for 5 minutes or so off the heat. This will give it time to thicken ready for serving. 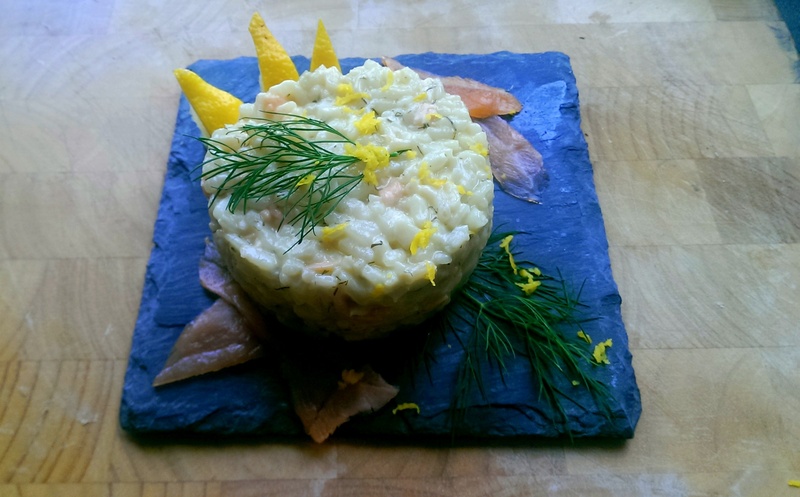 I like to garnish with fresh examples of each of the components – lemon zest, dill and some uncooked smoked salmon. Adding these components not only looks nice, but allows the tasters to appreciate each individual flavour. As for the slate…well, that’s just me being pretentious. 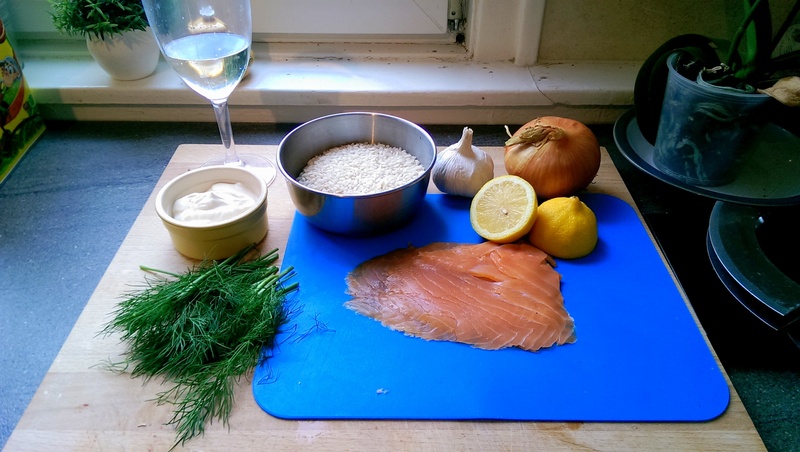 Posted in Fish, Guesscipes, Mains, One PotTagged dill, fresh, guesscipe, healthy, lemon, main, pescatarian, recipe, risotto, salmon, summer foodBookmark the permalink.